A few years back, John Lagier and Casey Havre of Lagier Ranches were looking for a new way to control the weeds in their 20-acre organic cherry orchard. Fuel was getting expensive, and they had a problem with an invasive weed called Johnson grass. After some research they arrived at a surprising solution: geese. They learned that if they bought new goslings in the spring, they could keep them in the orchard throughout the summer and fall. The timing was perfect, because CCOF, the farm’s organic certifier, doesn’t allow animals in the orchard for three months before the harvest. “We built a barn for them – and by the time they were old enough to go outside we were done picking the cherries,” says Casey. That first year they bought 40 geese, experimented with multiple varieties, and settled on the Toulouse, a gentle French breed known for the quality of their meat. During the second year, they expanded the flock to meet the minimum requirements for the local slaughterhouse. Now — three years in — their plan is working well. When the geese are very young, Casey feeds them Johnson grass, dandelions, and other weeds she wants them to develop a taste for. “It’s almost Pavlovian,” she laughs. Once they’re in the orchard, the geese are kept inside a movable fence that allows them to cover new terrain every few days. And because the geese worry (tear at) the grass’ roots, stunting the growth of each plant, John and Casey have also seen an overall reduction in weeds from year to year. Geese grow rapidly and mature within six months. When they’re young they need a lot of nourishment fast, but they eat fewer weeds as they age. So, by the time the holidays roll around, the geese are less useful as weeders and John and Casey are ready to sell them for meat. “If we kept them around, they’d become pets,” says Casey. “This way, it’s a nice little loop. The money we make in December offsets what we spend on the goslings in the spring, and the cost of the grain we feed the birds in the fall.” John and Casey buy local wheat from Nigel Walker at Eatwell Farm and supplement it with some home-grown polenta corn. Another source of food for the geese is bolted (or flowering) puntarella stalks from Annabelle at La Tercera Farm. 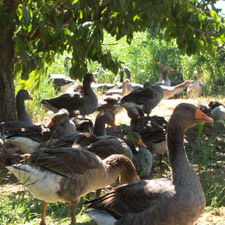 “When I walk in with puntarella, the geese go nuts,” she says. They also eat the dried cherries that are left in the orchard after harvest — which Casey believes makes their meat taste sweet. “They’re also very smart, beautiful creatures,” Casey adds. “There’s a lot to them. They’re pretty enjoyable livestock and I spend a lot of time with them.” So when it’s time for the flock to visit the big pasture in the sky, she and John send them to a small processor in Stockton whom they trust to do the slaughter humanely. The geese are then air-dried and chilled at 31 degrees. “They’re fresh but they have a thin crust of ice, so they last longer.” she says. This December, Lagier Ranches will have 250 fresh geese to offer for holiday meals. Between the farmers’ market and their restaurant clients — everyone from Chez Panisse to Roli Roti — Casey’s not worried about moving them. She’s already gotten some repeat orders from people who enjoyed them last year. They also keep a small number of their geese to eat over the winter. Casey says she uses a lot of cherries in the baking process – whether it’s cherry syrup or dried cherries in the stuffing. “I feel like since they grew up in a cherry orchard, it somehow demands it,” she says. To order a goose, stop by the Lagier Ranches booth any of the next few Saturdays or Thursdays. The birds will be available for pick-up starting December 19th. 1. Place an apple or two in the cavity as well as at the other end; it helps to keep the stuffing in and imparts a subtle flavor. 2. 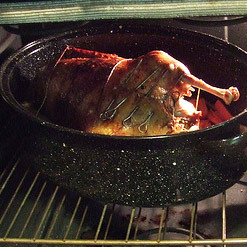 If you want the goose to look glossy, spread a thin layer of honey on the surface (I use my quince jelly) for the last 15 minutes of roasting. 3. For an unusual stuffing, use rye bread pieces and add crushed juniper berries to the mixture.